On the Jewish Calendar yesterday was our "move to Shiloh" anniversary, the 2nd of Ellul. On the goyish calendar we moved on September 1, 1981. Our daughters came by bus the day before, so they'd be here for the opening of the school year. When the girls, then aged ten 10, eight 8 and five 5, were sent on the bus alone by my husband, we didn't think it a strange thing to do. Never having owned a car, the girls were used to traveling by bus. In those days, private cars were rare, and the other passengers were mostly commuters going home to Beit El and Shiloh. I don't think there were any other stops on the route. The bus went through Ramalla; this predated today's Route 60. Most men, and a few women, had pistols for self-defense. The girls slept at the neighbors who had been assigned as our "mishpacha ma'ametzet," adoptive family, who were responsible for helping us settle into our new life in Shiloh. I had packed the girls up with what they needed for the first day of school, 5th Grade, 3rd Grade and Kindergarten. They were all going to study in different places. It was easiest for our youngest daughter, whose pre-school was located near where they were staying, though she didn't know any of the other children. Our eldest had to travel to Ofra for school. There was a van that took her and the other children 4th Grade and up every morning and then back to Shiloh at the end of the school day. She never missed it; there was no other way to get to and from school. Our second daughter was privileged to be able to study in Shiloh. The community had decided to open an elementary school to make Shiloh a more attractive and easier place to live in. Luckily, it had been decided to have a 3rd Grade class, and there were six children in it on September 1st, boys and girls together. She was the oldest girl. There were four children in the 2th Grade and eight in the 1st Grade. Over the next couple of months, one family left, a few moved to Shiloh, and the number of children in the school rose to about twenty. 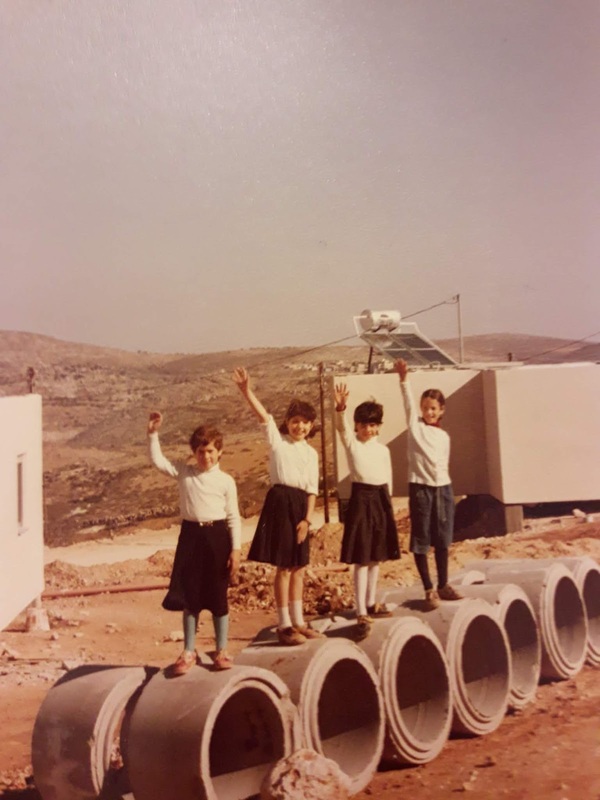 The new school was in three empty prefabricated houses in the new neighborhood where we live to this day. Then it was brand new without a paved road, sidewalks etc. Forty small cement houses had been placed on the barren hilltop, over a mile from Tel Shiloh, where everyone else lived. I don't think there were a dozen families when our moving van, with my husband in it, pulled up that day. I came with our newborn baby son by bus a few hours later. Of course, the bus didn't come up the hill; Egged only travels on paved roads. I had to go up in a ride. Not all of the houses had been hooked up to the electric generator, water and sewer. That had limited our choice of which to choose. During the first few days in our house, even though the toilets worked, we had to wash our hands in the kitchen sink. Despite the obvious difficulties, I really enjoyed being part of the great Zionist experience/adventure. Our neighborhood/community became very close, and we were helped a lot by the more veteran families "down the hill." Even for a writer like myself, it's hard to clearly verbalize what attracted me to Shiloh, but I've never had a doubt that Shiloh is the right place for us. I'd say that the best decision I/we ever made was to make aliyah and the second best was to move to Shiloh.